Providing you the best range of air freshener refill, air freshener refill - jade4500 expression, oxygen refill air freshener refill, oxygen cartridge grande, aerosol dispenser refill and aerosol refill with effective & timely delivery. The sense of smell plays an important role in our perceptions. According to a world leading authority, the Smell and Taste Treatment and Research Foundation in Chicago, the sense of smell plays a more vital role in making a first impression than sight or hearing. Smell directly impacts on the brain, has the potential to affect moods and prompts positive or negative responses. VIVA!e Air freshening system uses patented Oxy-Gen Powered Technology to deliver consistent and continuous levels of fragrance and odour control for the complete life of each cartridge, creating a permanently fresh environment that has fresh impact every time you walk into the room. VIVA!e dispensers are available in two options: 60 day cycle for everyday fragrance intensity and 30 days cycle for booster fragrance intensity. When using the Grande cartridge, the dispenser can be programmed to work for 30 days, 60 days or 90 days. The cartridge contains 35 ml of pure fragrance oil, that is approximately 7 times more fragrance oil than a standard metered aerosol can. The fragrance intensity can be changed to a strong (30 days), normal (60 days) or (90 days) mild scent. Specifications 100ml refills Will give 3000 shots. Coverage area 170 Cubic Meter (6000 Cubic Foot). Specifications: 250ml refills : Will give 3000 shots. Coverage area : 170 Cubic Meter (6000 Cubic Foot) fragrance perfume bottle is available in 250 ml. Aircare fragrances are modern and offer style and impact options to match all preferences. All Aircare fragrances are complex, long lasting and are available in both standard and micro sized aerosol refills (suitable for use in most automatic aerosol dispensers, including the Airoma Automatic Odour Control system). Aircare fragrances contain Airomanol odour counteractant to neutralize malodours. - 3000 metered sprays per refill - Effective in room sizes up to 400sq. ft.
Aircare fragrances are modern and offer style and impact options to match all preferences. All Aircare fragrances are complex, long lasting and are available in both standard and micro sized aerosol refills (suitable for use in most automatic aerosol dispensers, including the Airoma Automatic Odour Control system). Aircare fragrances contain Airomanol odour counteractant to neutralize malodours. - Effective in room sizes up to 400sq. ft.
Aircare fragrances are modern and offer style and impact options to match all preferences. All Aircare fragrances are complex, long lasting and are available in both standard and micro sized aerosol refills (suitable for use in most automatic aerosol dispensers, including the Airoma Automatic Odour Control system). Aircare fragrances contain Airomanol odour counteractant to neutralize malodours.All these products are available in noida, delhi NCR - 3000 metered sprays per refill - Effective in room sizes up to 400sq. ft.
• 100ml refills : Will give 3000 shots. 130ml refills : Will give 3000 shots. Coverage area : 175 Cubic Meter (6000 Cubic Foot). 100ml refills : Will give 3000 shots. Coverage area : 170 Cubic Meter (6000 Cubic Foot). Packing : 1 Carton will have 24 pcs. Weight : 2.6 kg per Carton. No of Days : Can last up to 180days as per Hygiene fresh Dispenser Settings. Fragrances : 15 Fragrances available in 100ml refills. We also provides customized fragrances, according to customer’s needs. Hygiene Fresh Air freshener comes in three volume. 100ml, 200ml and 250ml. 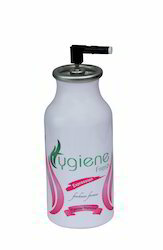 Hygiene Fresh 100ml refills is one of our best selling product. Its is preferred by most of our consumers. It is called the Golden Key refill because it can fit in any standard 100ml dispenser available in the market. 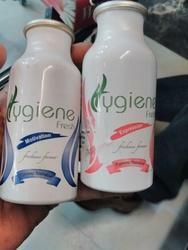 Hygiene Fresh 200ml refills is also best seller in the market and offer style. 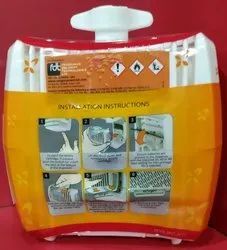 This refill is specially design to fit in our dispenser. Hygiene Fresh 100ml TIN cans refills is for our competitor dispenser. Hygiene Fresh 250ml TIN cans refills is for our competitor dispenser. Usage area - Ideal for areas such as washrooms, offices, toilet areas, home care, hospitals, hotels, reception areas. Institutional Market like Malls, Airports, Train & Bus stations, Restaurants, Schools etc where Hygiene Standards are specified. Customer satisfaction - We have customers who are satisfied with our modern fragrances which works with odor neutralizers to remove bad odors and create a clean fresh environment that reassures our customers that the room is safe and comfortable to use. Cost efficiency – Hygiene Fresh refills have 30% more concentrated fragrant oil and can last 10-15mins. With a minimum refill life of 180 days. Value - Most effective by using pharmaceutical valve technology for microscopic spray dispersal that travels further into the room & stays longer in the air. It distributes three times more power-per- ounce of traditional aerosols & provide full strength odor control. Actuator Type - Two Type of actuator which can fit in the can according to the customer need. Technology - We have our own Laboratory which is using new technology designer fragrance oils for professional long-lasting strength and quality. Recyclable Aluminum Can - Manufactured with recyclable aluminum can to support Green Technology. It is Eco Friendly. It has lacquer coating inside the can to prevent rust, leakage & moisturizer. No joints needed like tin. Thus reduces risk of bursting in higher temperature (for Hot Weather condition places). The Stem is made of Metal which will not break-off and leak. Hygizene Neutralizer - 30% more concentrated fragrance with Hygizene Neutralizer that eliminate odors completely as to avoid mixing uncomplimentary smells together. No CFC(chlorofluorocarbon) hazardous materials added which can be harmful to the ozone layer. Metal Stem - Contains Metal Stem and Pharmaceutical Valve with actuator to generate measured & perfect spray. It''s a microscopic spray that will disperse and will travel further into the room and hangs longer in the air. Printing - Aluminum can will have label printed on the can itself. Manufactured in one piece. Country of Origin - Made in UAE. 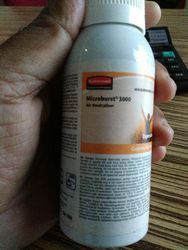 250ml refills : Will give 3000 shots. Packing : 1 Carton will have 12 pcs. Weight : 3.2 kg per Carton. No of Days : Can last up to 180days. (fit only in competitor dispenser). Fragrances : 15 Fragrances available in 250ml refills. We also provides customized fragrances, according to customer's needs. • 150ml refills : Will give 3000 shots. • Coverage area : 190 Cubic Meter (6000 Cubic Foot). • 250ml refills : Will give 3000 shots. • Coverage area : 170 Cubic Meter (6000 Cubic Foot). • this is a very good Fragrance Dispenser refill. The sense of smell plays an important role in our perceptions. According to a world leading authority, the Smell and Taste Treatment and Research Foundation in Chicago, the sense of smell plays a more vital role in making a first impression than sight or hearing. Smell directly impacts on the brain, has the potential to affect moods and prompts positive or negative responses. Vibrant fragrance is not a gender specific fragrance hence it is suitable for both genders. Looking for Air Freshener Refills ?